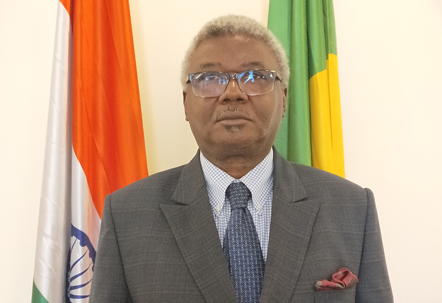 Ambassador Extraordinary and Plenipotentiary of the Republic of Mali to India, Bangladesh, Bhutan, Brunei Darussalam, Indonesia, Malaysia, Nepal, Singapore, Sri Lanka and Thailand with residence in New Delhi. Diplomatic Counselor of the Prime Minister of Mali. Diplomatic Counselor of the Minister of Defence of Mali. Ambassador, Permanent Representative of Mali to the United Nations – New York. Ambassador, Director of International Organizations at the Ministry of Foreign Affairs of Mali. Inspector at the Inspection of Diplomatic and Consular Services at the Ministry of Foreign Affairs of Mali. Mali Coordinator at the Human Rights Council in Geneva. Mali Coordinator of the Network of Human Security in Geneva. First Counselor and Charge d’Affaires to the Permanent Mission of Mali to the United Nations Office in Geneva and to the United Nations Office in Vienna with residence in Geneva. Mali Coordinator at the UN Security Council in New York. Diplomatic Counselor of the Minister of Foreign Affairs of Mali. First Counselor and Charge d’Affaires at the Embassy of Mali in Algeria, Mauritania, Tunisia and Cyprus with residence in Algeria. Deputy Director of Legal Affairs at the Ministry of Foreign Affairs of Mali. Head of the International Agreements and Treaties Division at the Ministry of Foreign Affairs of Mali. Integration at the Ministry of Foreign Affairs and International Cooperation of Mali.